Author Jonathan Swift wrote that the purpose of his writing, “is to vex the world rather than divert it.” Throughout Gulliver’s Travels, Swift satirizes scientists, academics, snobs, politicians, lawyers, doctors, and – unfairly – women. Swift further parodies travel writers’ preoccupation with appearing to be “experts” in everything they write. Lemuel Gulliver, a sea-loving surgeon and “everyman” travels to four lands and has numerous adventures. The imaginary worlds, fantastic characters, and exaggerated stories of Gulliver’s strange and exotic adventures, draw the reader into the narrative (and inspire film adaptations). Gulliver begins the journey larger than life in the land of the tiny Lilliputians, and after observing mankind’s tendency toward greed and selfishness, he finds himself most contented in a land of horses governed by reason. The moral of the novel suggests that the only ideal world is one in which humans do not rule. 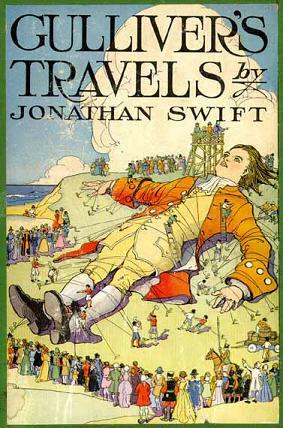 “Satire,” Swift wrote, “is a sort of glass, wherein beholders do generally discover everybody’s face but their own.” The staying power of Gulliver’s Travels lies in the fact that the more things seem to change, they really don’t: mankind has been, and continues to be, motivated by avarice and folly. The practice of economically exploiting other countries was the policy of English and French colonial governments during Swift’s time, just as modern world powers go into underdeveloped cultures and consume their resources. Conflicts of religious ideology, as observed in the battle of the “Big Endians” and the “Small Endians,” are still apparent, as evidenced by the discord throughout the Middle East. Even the feuds between the “High Heels” and the “Low Heels” in the novel continue between and among current political parties. Despite Swift’s critique of humanity and its institutions, however, he seems to have felt passionately enough about mankind to hope that those who read the book would reconsider themselves and the world around them in order to help make it a better place – “vex” readers into thinking, rather than “diverting” them into switching their thoughtfulness off.